Livos products have been available in Australia for over 20 years and their use in Australian conditions has proved to be successful. Livos Australia Pty Ltd is based in Melbourne and supplies a large range of Livos non-toxic plant based oils for interior and exterior use, waxes, paints and tints for interior surfaces as well as a range of cleaners. Plant based finger paints and face paints are also available. These products are available throughout Australia, see our "Outlets" page for more details. The directors bring with them a wealth of experience in working with timber and the Livos products both in Europe and here in Australia. Our commitment is to incorporate environmental awareness and high quality service with years of experience obtained in Europe and Australia from using the Livos range of products. We commit ourselves to keeping abreast of new developments and passing these onto our suppliers and customers. Read more about the Livos Story. Over 45 years of research, experience and constructive innovations makes LIVOS Germany the oldest industrial manufacturer of ecological paints and oils, World Wide. Made without harmful chemicals, LIVOS products contain only biologically and environmentally responsible ingredients, grown without the use of pesticides. In the early 70s in Germany, a small group of teachers including some hobby chemists created out of need, non-toxic finger-paints for their students. Once these safe paints became known, the teachers were flooded with request from schools and hospitals. They then started to develop paints and varnishes based on natural raw materials. The result of this pioneering work was the foundation of Livos (Pflanzenchemie Forschungs und Entwicklungsgesellschaft), Plant Chemistry, Research and Development in 1974. Based now in Wieren, in the northern part of Germany, Livos became the first worldwide industrial manufacturer of ecological paints and oils. These products are now distributed around the world. Only products of excellent quality that are absolutely healthy and ecologically friendly are given the Livos name. Due to the ever increasing numbers of allergy sufferers, including those sensitive to various chemicals, Livos has openly declared the ingredients in all their products, and this since 1984. This allows the consumer to make an informed and final decision. In addition, with extensive and sound knowledge and know how, Livos developed a specialised range of products for those with chemical sensitivities and allergy sufferers and this as early as 1988. Livos's sound knowledge in the field of plant chemistry is continuously extended and explored. It accepts the challenge of the future, be it in research, development or the constant improvement of existing products. Livos natural paints and finishes are derived from plant oils, natural resins and waxes, earth and mineral colours rather than from petroleum and industrial by-products. The precious raw materials are grown under supervision and harvested in compliance with the principles of sustainable resources. They are constantly monitored and quality control samples of each batch manufactured are kept for five years. Livos products do not contain synthetic fungicides or other synthetic poisons. 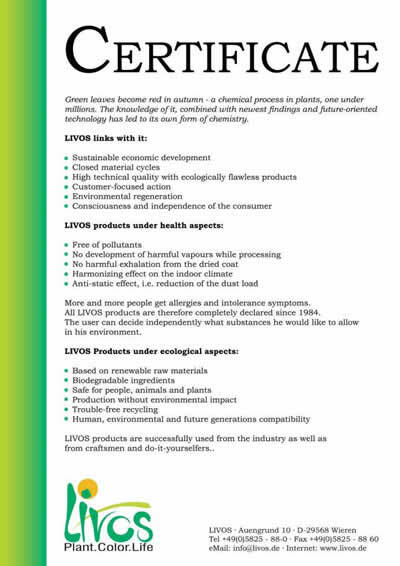 See the page "List of Raw Materials" for ingredients used in the Livos products. One may ask then why we purchase Livos from Germany. Have been developed according to a holistic criteria. Meet health and ecological criteria. Thoroughly tested for beneficial working qualities. All contents are fully declared.